Hiking through some of Green Gulch's 115 scenic acres. Why go in spring: Perfect weather and spring blooms add to the serenity of this Marin County valley retreat 20 minutes north of San Francisco’s Golden Gate Bridge. Who lives there: 70 students and teachers of Soto Zen Buddhism. Who visits: Young urbanites, Marin baby boomers, spiritual seekers from around the world. Zen for dummies: Half-day public programs every Sunday teach meditation basics (8–12:45; no program Apr 4; $5–$10 donation suggested; 1601 Shoreline Hwy./State 1, Muir Beach; sfzc.org/ggf or 415/354-0411). Way of tea: One Sunday a month, a traditional tea ceremony follows the program (1:30–3 Apr 11; $25; reservations required). Always greener: Green Gulch’s organic farm supplies vegetarian mainstay Greens Restaurant in San Francisco. Take a hike: George W. Wheelwright, farmer and cofounder of Polaroid, practically donated these 115 prime acres on the condition that the public could always use the trails to the shore. Loath to leave? Stay in the center’s octagonal Lindisfarne Guest House (from $205, including meals; 415/383-3134). A Buddha statue sits amid the trees in the garden. Make your way down a path to the zendo, a Japanese-style meditation hall converted from a barn. Clasp your hands and remove your shoes for an hour of instruction. When it’s time for meditation, cross your legs. Sit up straight. Gaze softly ahead. Breathe normally. Don’t sleep. Thoughts will arise: Let them. After 45 minutes of silence, a bell rings. 8:15–10:15 Sun (no program Apr 4). After a dharma talk on Buddhism or meditation, and before a Q&A with the teacher, it’s break time outside the zendo. Have tea and a fresh muffin or a warm loaf of sesame bread, made from the classic Tassajara Bread Book, from Green Gulch’s parent San Francisco Zen Center. A light lunch ($10) at 12:45 Sun follows the question and answer session. Exploring the paths around the Green Gulch Zen center. Bliss out among the 42 varieties of apple, pear, and plum trees. On a stroll to the central Japanese snowbell tree, stop to smell herbs and admire flowers like Siberian iris and camellia. Meditate to the swaying of the bamboo in the Peace Garden. Gardens and organic nursery open 9–4 daily except during retreats. Blossoming fruit trees in the Green Gulch gardens. The sheltered sands of Muir Beach are just a half-mile walk down valley from the gardens, past the center’s organic farm. For a longer hike, head up the ridge on the Green Gulch Trail to link to the Coastal Trail for a loop back to the center with splendid ocean views (about 3 miles). Take it home: At the 11:15 tea break, look for baskets of produce grown right here on the farm. In spring, that might be spinach, kale, and chard. You can also pick up a jar of the center’s homemade organic plum or quince jam ($5.50) at the tea break or from the bookstore. 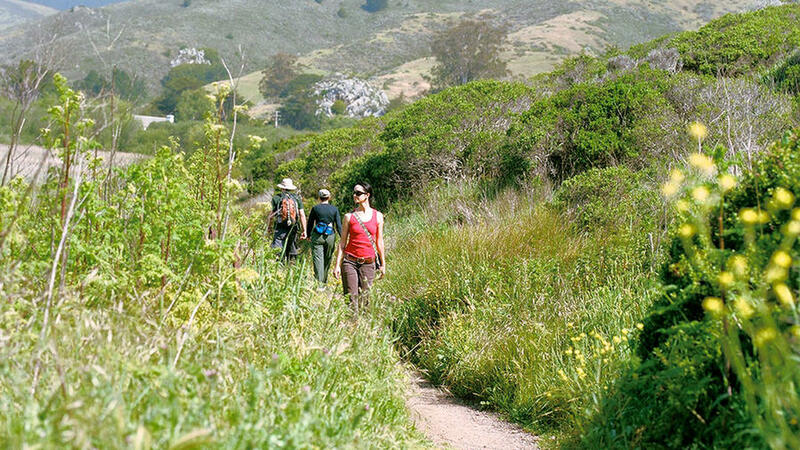 Getting to Green Gulch: From U.S. 101 in Marin, take State 1/Stinson Beach exit. Green Gulch is just before Muir Beach. Santa Rosa, CA: On 82 acres of rolling hills, Sonoma Mountain Zen Center offers a taste of everyday Zen practice—meditation, chanting, a bit of work, a lecture, and lunch. 5:15–noon Sat; no program Apr 10; $10 donation suggested; 6367 Sonoma Mountain Rd. Carmel Valley, CA: From May through September, Tassajara Zen Mountain Center—the first Soto Zen monastery in the States—opens its meditation hall and Japanese-style natural hot-spring baths to day visitors. $25, lunch $12; reservations required. Marin County, CA: Tucked in the San Geronimo Valley on 410 acres of grassland and oak woodland, the Spirit Rock Meditation Center hosts day programs like “Happiness and the Causes of Happiness” (Apr 24; from $90) from a Buddhist perspective. 5000 Sir Francis Drake Blvd., Woodacre.